Please click on the button above to view the webinar. Join this webinar to hear case studies and key success factors in using global heath data and market insights for more targeted, successful brand launches. Our industry is on the precipice of moving from the pharmaceutical age to the data age in healthcare. 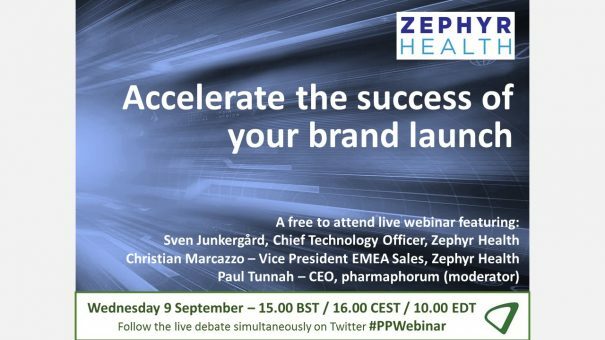 Working with Zephyr Health, this webinar will discuss concepts such as data maturity, achieving decision excellence and ultimately why those companies which embrace the untapped opportunities available now will rapidly develop competitive advantage.Zephyr Health experts Sven Junkergärd and Christian Marcazzo join pharmaphorum’s Paul Tunnah to discuss how and why brand launches can be accelerated through intelligent and innovative use of data in all segments and disciplines within life sciences companies, and drawing from their extensive experience, show what you can do to implement these learnings. Sven specializes in researching and developing new technologies, partnerships and data sources for Zephyr Health’s unique and robust platform with a focus on scaling for global growth and innovation. With over 15 years’ experience in integrated enterprise IT and systems architecture, he is particularly passionate about creating technology solutions from concept to scale by building strong engineering teams and developing multi-faceted business partnerships. Sven’s accomplishments include industry-leading technology patents for systems and methods that generate rank scores, performance indices, real-time data integration of trusted peer sources and data disambiguation for meaningful mapping and intelligence. Christian has spent the past 20 years bringing innovative big data and analytics technologies to market. Early in his career, that focus was in bioinformatics and the challenges posed by the human genome project and the vast data volumes being produced for scientific research at LION bioscience. Prior to joining Zephyr, Marcazzo led sales and business development for Spotfire’s data visualization and analytics efforts and expanded the business from scientific research into clinical trials, commercial, and into new industry verticals.